Cairo, August 22nd 2011. 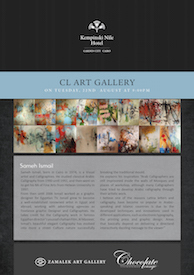 Celebrating Kempinski's European heritage and appreciation of fine art and culture, Kempinski Nile Hotel's Chocolate Lounge will premiere a special art exhibition, for Egyptian renowned Artist SAMEH ISMAIL in the hotel's Chocolate lounge, Cairo's only art cafe & in conjunction with ZAMALEK ART GALLERY. Sameh Ismail, born in Cairo in 1974, is a Visual artist and Calligraphies. He studied classical Arabic Calligraphy from 1990 until 1992, and then went on to get his BA of Fine Arts from Helwan University in 1997. From then until 2006 Ismail worked as a graphic designer for Egyptian TV. Ismail grew to become a well-established renowned artist in Egypt and abroad, working with advertising agencies as freelance graphic Designer and Calligraphies. He takes credit for the Calligraphy work in famous Egyptian director’s youssef chahian Film, Al Masseer. Ismail's beautiful elegant Calligraphy has evolved into more a street Culture nature successfully breaking the traditional mould. He explains his inspiration "Arab Calligraphers are still imprisoned inside the walls of Mosques and places of workshop, although many Calligraphers have tried to develop Arabic calligraphy through their artistic work. I believe one of the reasons Latina letters and calligraphy have become so popular in Arabic-speaking and Islamic countries is due to the developed techniques and innovations used in different applications, such as electronic typography, the printing press and graphic design. Areas that basically depend on delivering a direct and interactively dazzling message to the viewer"